Spring is finally here and, with renewed vigour, the Choir is busy practising some beautiful pieces for the June concerts. 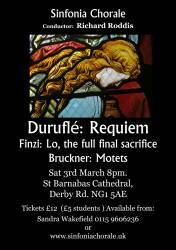 What a contrast this is to the extremely cold and snowy evening in March when our last concert took place in St Barnabas Cathedral! The programme was made up of three devotional pieces of a very contrasting nature. The first item was the performance of four motets by Anton Bruckner, full of rich, sonorous harmonies. 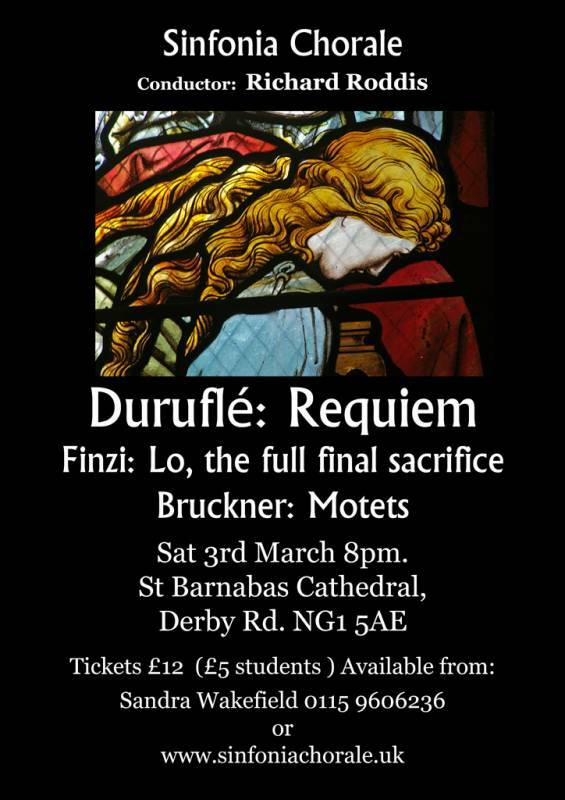 This was followed by the wonderful Festival Anthem by Gerald Finzi, Lo, the Full, Final Sacrifice, which portrays the liturgical drama of the Eucharist. The Choir gave a particularly moving performance of this piece, as did the three soloists taken from the Choir, Sue Jolly, Matt Burton and Theo Drabble. Finally, the Choir performed the wonderful Requiem by Maurice Duruflé. Based on the Gregorian Chant themes of the Mass of the Dead, this is Duruflé’s most famous composition and sets a mood of rest and tranquility with its lovely ethereal sonorities. 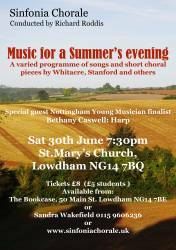 Returning to Spring warmth and joining us in June, we have two very talented soloists - both finalists in the 2017 Nottingham Young Musician of the Year. 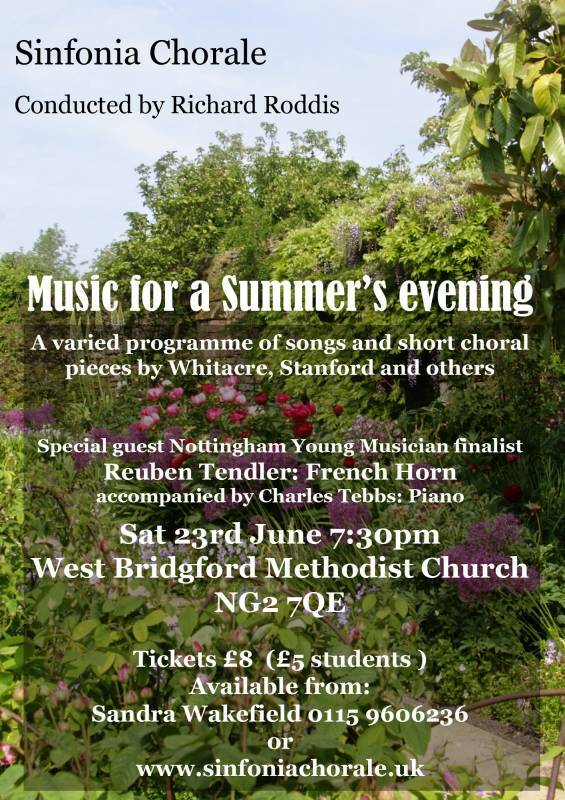 On Saturday 23rd June, our guest soloist will be Reuben Tendler (French Horn) playing, amongst other pieces, Alan Abbott’s Alla Caccia and Melodie no.1 by Rubinstein. 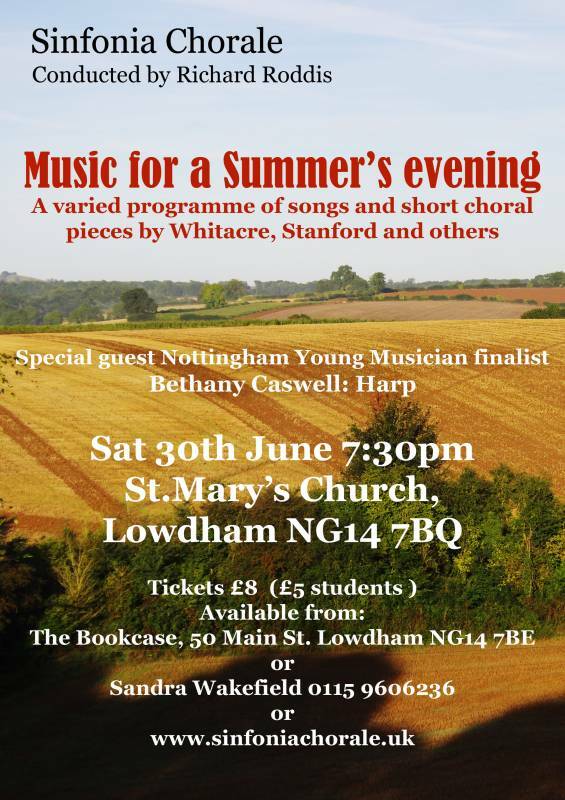 On Saturday 30th June, we will be welcoming the harpist, Bethany Caswell, who will be playing several delightful pieces, including Harpicide at Midnight by Pearl Chertok and Guridi’s Viejo Zortzico. We are all looking forward to hearing these two amazing young performers - book your tickets soon! 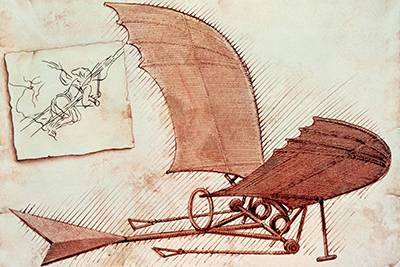 Another highlight, especially if you enjoy Eric Whitacre’s compositions, is his work Leonardo Dreams of His Flying Machine, with a libretto bréve by Charles Anthony Silvestri and Italian fragments taken from the notebooks of Leonardo Da Vinci himself. This challenging, but very rewarding, piece paints a colourful, dynamic picture of Leonardo’s journey towards conquering gravity, whilst ‘tormented by visions of flight and falling’. Numerous voice parts interweave, creating a rich, colourful texture which reaches a dramatic climax in the middle of the piece as Leonardo ‘takes one last breath, and leaps’! 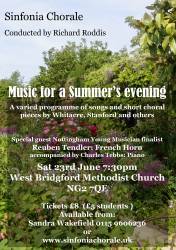 Tickets for both concerts are priced at £8.00 (£5.00 for full-time students under 21) and are available from Sandra Wakefield on 0115 9606236, or from the Sinfonia Chorale website. We hope to see you in June and thank you so much for your continued support! Here’s to a music and sun-filled summer!